What do you do when a long lost ancient artifact pops up at your doorstep? If your name is Lila, and you are a promising archaeologist and more important a demon hunter - you should know what to do! The tide of darkness is emerging to swallow the light! 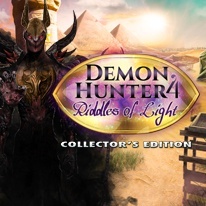 Help young Lila to put back together the mighty Gauntlet of Horus and wield it's powers to save her family and the world in Demon Hunter 4: Riddles of Light Collector's Edition!